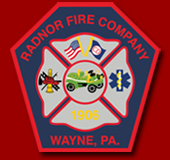 Radnor Fire Company was dispatched at 9:23 a.m. Thursday to the intersection of King of Prussia and Pine Tree Roads in Wayne for reports of a car on fire. Radnor Police were first on scene and confirmed a Grey Nissan Altima was on fire in the southbound lane of King of Prussia Road in front of Cabrini University. Squad 15 and a crew of Radnor Fire Fighters arrived on scene before 9:30 a.m. to find the car's engine compartment fully involved. Fire fighters pulled a bumper line from Squad 15 and quickly put the fire under control. Radnor Police briefly closed King of Prussia Road in both directions. There were no reported injuries and Squad 15 cleared the scene by 10 a.m.